Mix all together and place about 1 Tbsp of mixture in each wonton wrapper. Place 2 Tbsp peanut oil in a pan and heat oil. Add pot stickers and brown about 2 minutes. 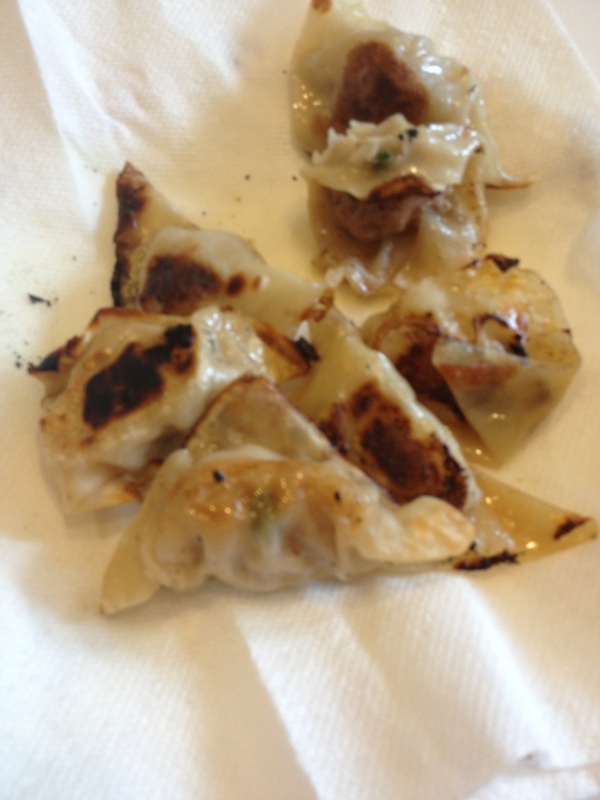 Don’t move the pot stickers in the pan the will stick a little but will release after finished cooking. Add 1/4 cup of water to pan, cover and cook about 5-7 minutes. In a 9 inch spring form pan place a piece of parchment paper on the bottom, lightly spray with nonstick spray. Preheat oven to 325 degrees. In a small bowl add cookie crumbs, sugar and butter. Stir until are crumbs are moistened. Place in the bottom of your prepared spring form pan and up the sides about 1/4 of an inch. Place in freezer while you make the filling. In mixer beat cream cheese until fluffy. Add sugar, cornstarch, vanilla and coconut extract beat until combined. Add eggs one at a time beating on low just until egg is combined. Stir in Cream of coconut. Pour into prepared pan. Bake for 75 minutes until center is just set. Place on rack cool for 15 minutes and then run knife around edge. Continue to cool for another 45 minutes. Place in fridge and let set at least 3 hours. In a sauce pan on medium heat add whipping, chocolate chips and vanilla. Heat while stirring until smooth. Remove from the heat and let stand until room temperature. 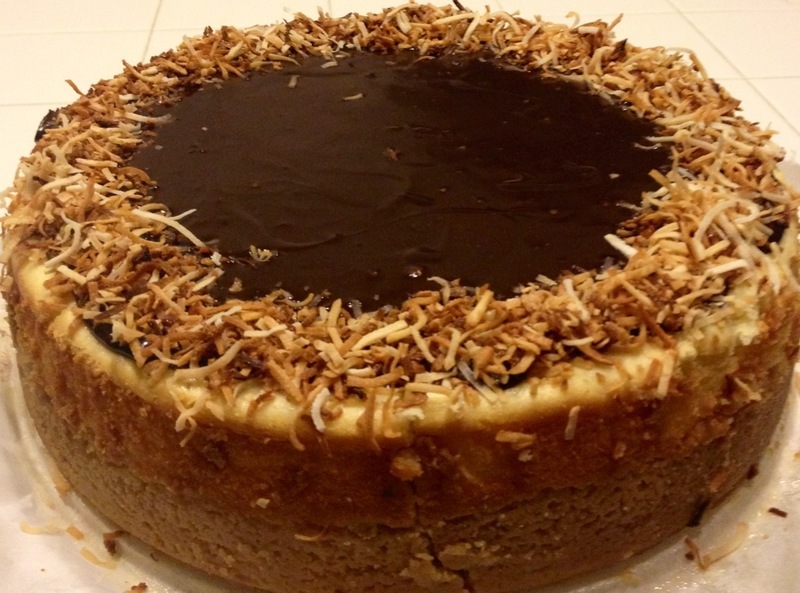 Top cheesecake with ganache and toasted coconut place back in fridge overnight! In a bowl add beat together eggs and buttermilk. 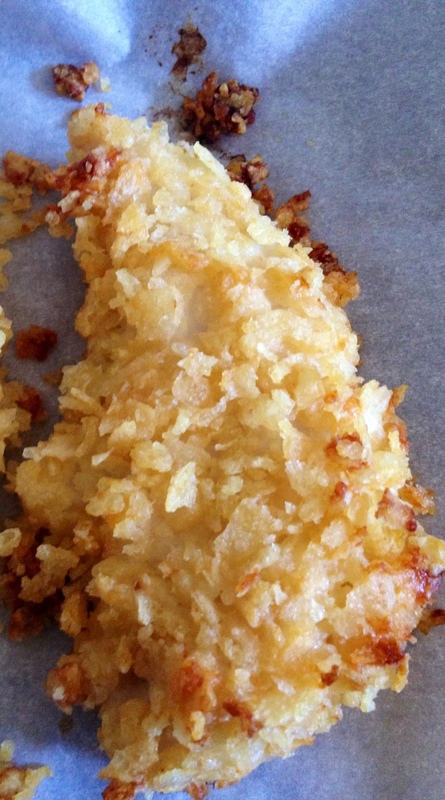 Place chicken tenders in bowl and stir to cover chicken. In blender place chips and pulse till crumbs. You can also place them in a large ziplock and smash to crumbs. In a bowl whisk together dry ingredients. Over Medium heat combine milk, butter and vanilla, until butter melts. Add dry ingredients to milk mixture, stirring constantly. Bring to boil, stirring until thick and smooth, about 5 minutes. Cool and place in fridge until ready to use. Preheat oven to 350 degrees. Spray 2- 8×8 square pans and line the bottom with parchment paper. Set aside. Melt chocolate and butter slowly in a pot over low heat. Remove from heat, stir in cocoa powder and sugar. Whisk in vanilla and eggs one at a time. Finally stir in flour and salt. 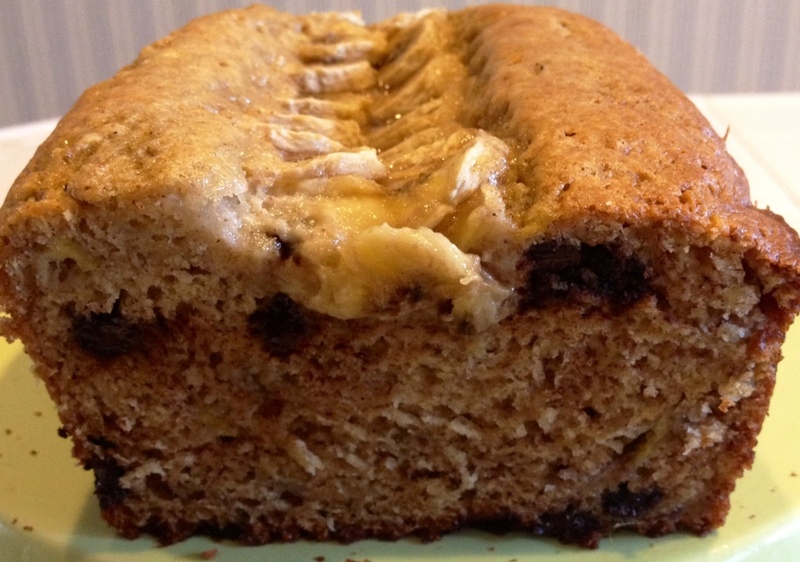 Pour into your prepared pans and bake 25-30 minutes. Let cool on rack. In a 8×8 pan lined with parchment paper spread 1 gallon of softened ice cream into bottom of pan. Place in freezer until ready to assemble. I used vanilla put you can use whatever flavor you like. Place 1 layer of cooled brownies on a cake board. 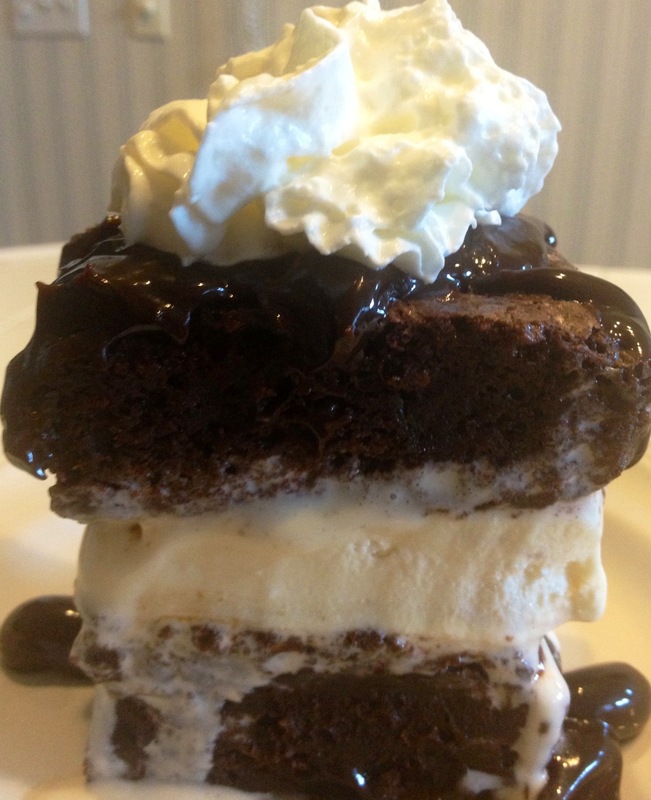 Place ice cream on top and then second layer of brownies. Wrap tightly in plastic wrap and place in freezer until ready to top and serve. Cut tops off artichokes. Place crumbs and Parmesan in a small bowl,combine. 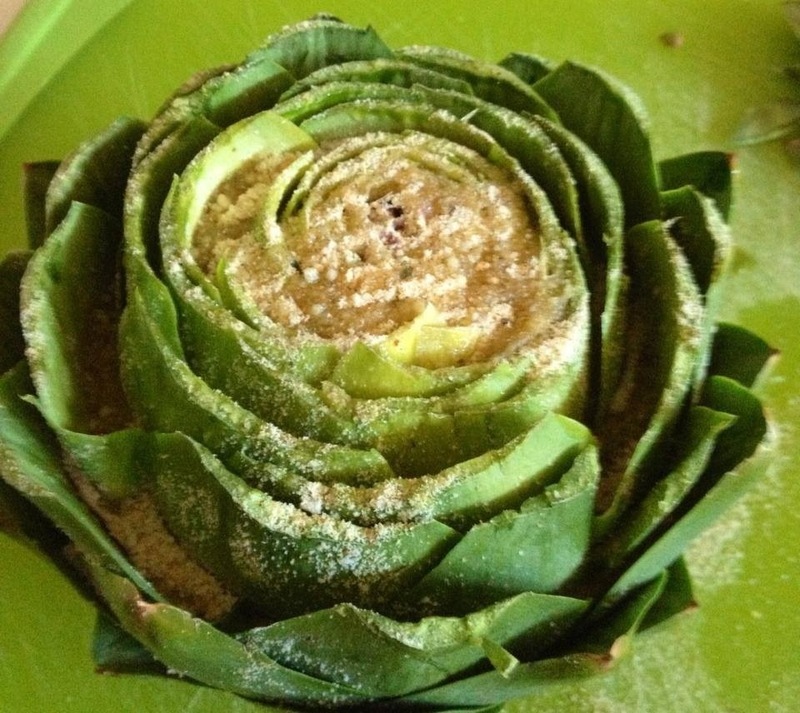 With a spoon place crumb mixture in between leaves of artichokes. Drizzle tops with olive oil. Place in a large pot with water. Steam for about an hour till leaves pull out easy. In a large pan with a lid on medium heat, heat olive oil. Add sausage and slowly cook, turning until all sides are brown. Once completely browned remove sausage, slice and set aside. Turn heat to high and add peppers and onion. Turn to coat in olive oil, stir every so often. Once peppers and onion begins to soften add garlic and cook for about a minute more. Add wine to pan and with a wooden spoon scrape bottom of pan to get off browned and blackened bits. Let wine cook down by half. Add tomatoes and sausage, stir. Let simmer. Turn heat to low. Place lid on pan and continue to cook for 30 minutes. 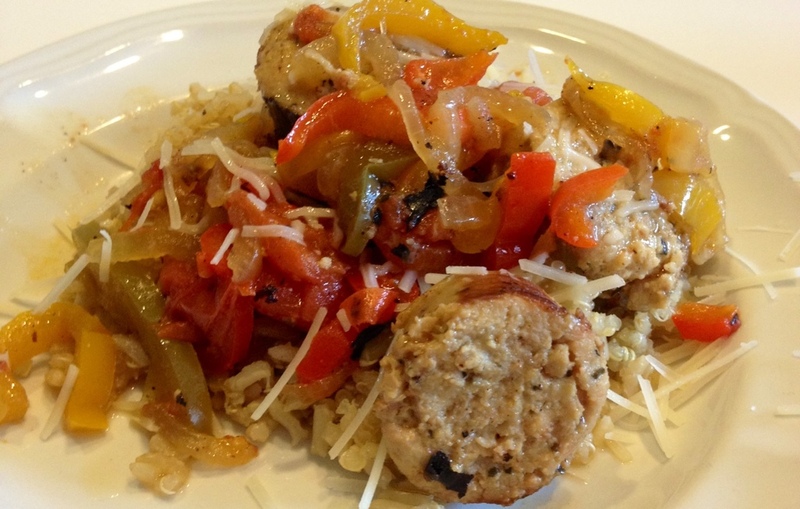 Serve over rice, Quinoa, noodles or whatever you prefer with a sprinkle of Parmesan cheese on top.